E and Claire canceled Sunday Stowe program on the 23rd due to the cold, but today we were back at it. 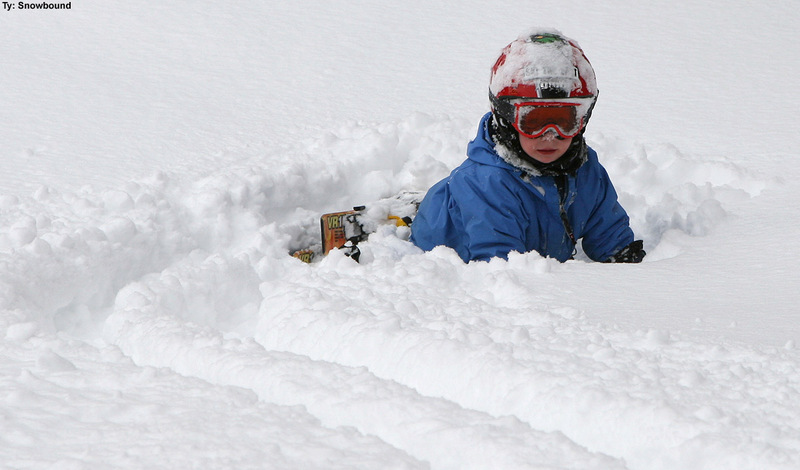 After a fairly dry week, we’d received some nice new accumulation up at Bolton to freshen up the slopes yesterday. Down in the valley at the house, we wound up with 1.4 inches from that event, and there was more on the way for today. In my update from this morning, I summarized yesterday’s storm that had just gone through, discussed the next shortwave that was about to cross the area, and mentioned talk about a larger midweek system that might actually deliver something more substantial to Northern New England for a change. We got up to the mountain around midday, and there was already some nice snow in the air. Our group started off with Ty, Dylan, and Luke, and while Claire worked on organizational issues like Ethan forgetting to bring his skis and Sam having his skis taken by accident by someone with an identical pair, I took the boys for a run. With plenty of untracked powder in the lesser used areas off piste, it was a great day to jump into the trees and get Luke more experience in there. The boys gobbled up the fresh snow in the Upper Meadows trees, and Luke not only got some good tree skiing experience, but some practice extricating himself through a brushy exit. Jack joined us next, and I brought all four boys through the Meadows East Glades. 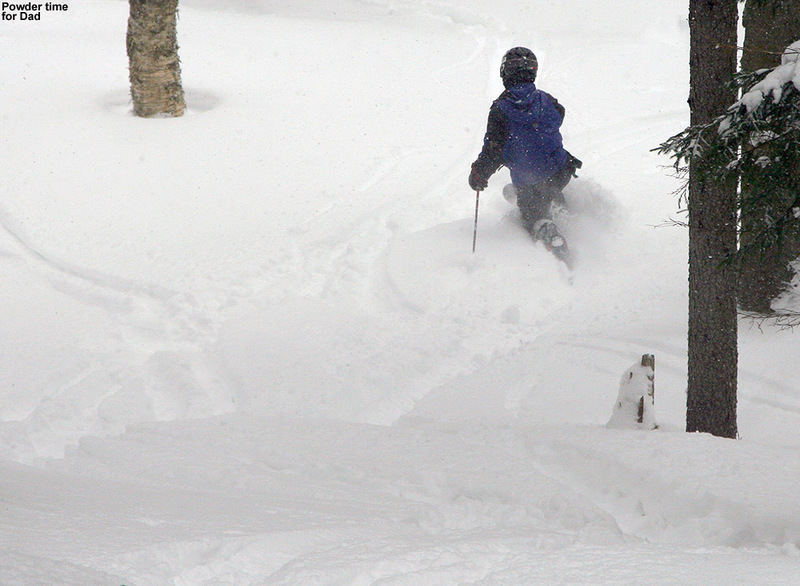 The main lines were tracked or packed, but boy there was still plenty of fresh powder all outside the formal glades. 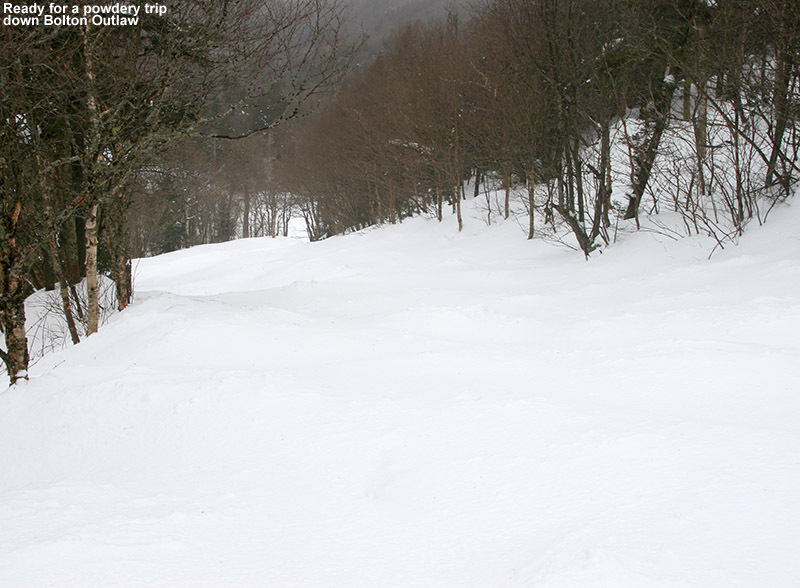 Even at that point before the subsequent pair of bigger synoptic storms, Stowe’s snow depths were getting to the stage where many of the natural tree areas open up just like the glades because the brush has been buried under the snowpack. Claire continued to work out program issues, so I headed to the Sensation Quad with the boys. From fairly light snow at the base of Sensation, we ascended into quite a winter wonderland as more vigorous snow and some winds quickly greeted us on the ascent. The conifers were caked in snow just as if we were in the middle of a larger storm cycle, and Powderfreak had some great shots of the intense snowfall. We kept gawking at the awesome powdery routes below us on Spruce Line, and lamented the fact that it was closed, whether due to coverage or the race that was taking place on Main Street. I vowed that if those race or coverage issues were gone by the following week, we would definitely be hitting that terrain. Even more than the main routes of Spruce Line, I was drooling over the steep shots dropping off the Main Street traverse into the evergreen glades that had been created alongside the trail. I’m not sure if I just forget that this terrain exists every season, or if they keep improving it, but I’m immediately reminded of Red Mountain in British Columbia. I couldn’t find any images of what I’m recalling in my collection, but runs like Cambodia and Short Squaw come to mind. 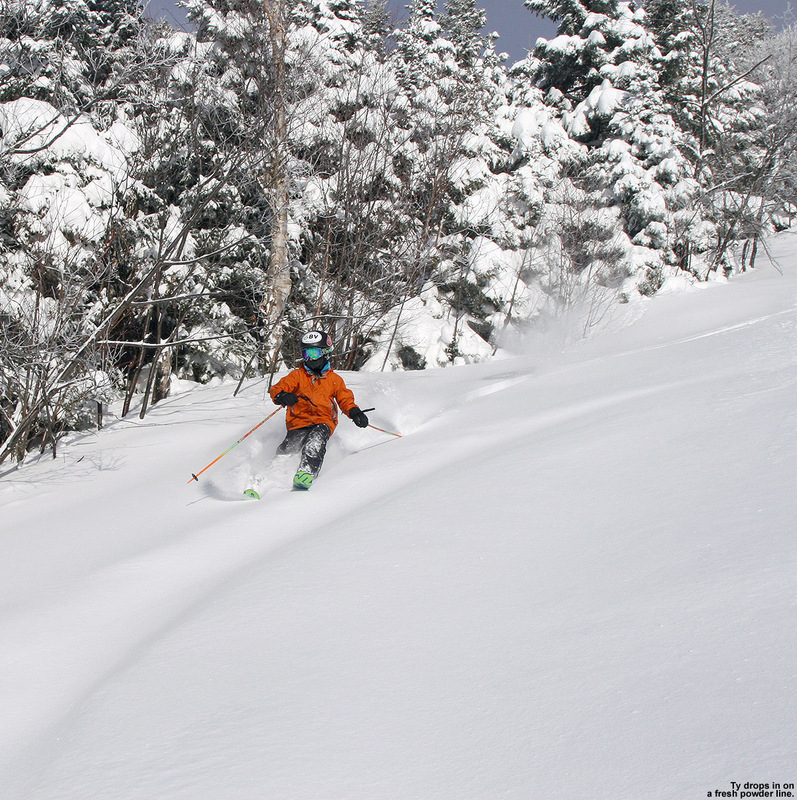 To read the full text and check out all the pictures, click through to the Stowe report from today. 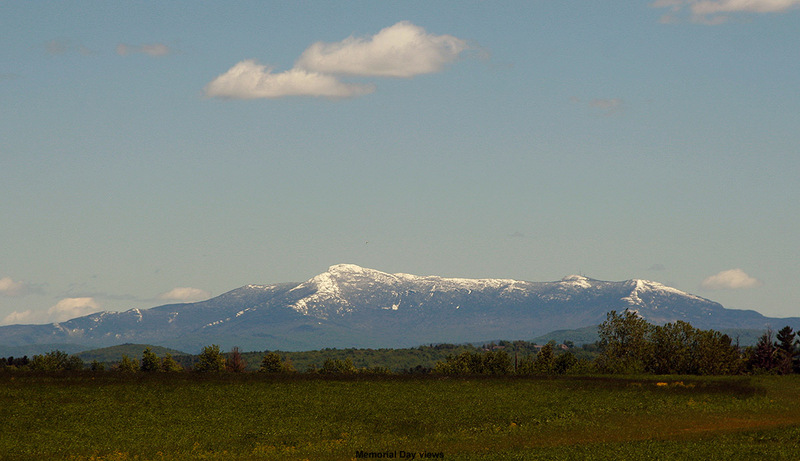 It was a little tough to motivate the boys for skiing last Saturday, since there hadn’t been any significant storms reaching Northern Vermont. At the house we’d picked up just a couple inches of snow in the preceding week, and even up in the high country Bolton was reporting just 5 inches of accumulation for the period. Without the fresh powder to get the boys jazzed up, E and I took a suggestion from Stephen and threw in the option of doing some swimming at the Sports Center after skiing. In actuality we suspected that the skiing would be quite good; temperatures had been rather wintry though the period, and a small clipper-style system was in the process of freshening up the slopes and even bringing snow down to the valley, but the carrot of swimming definitely made it easier to get the boys out there to enjoy the conditions. 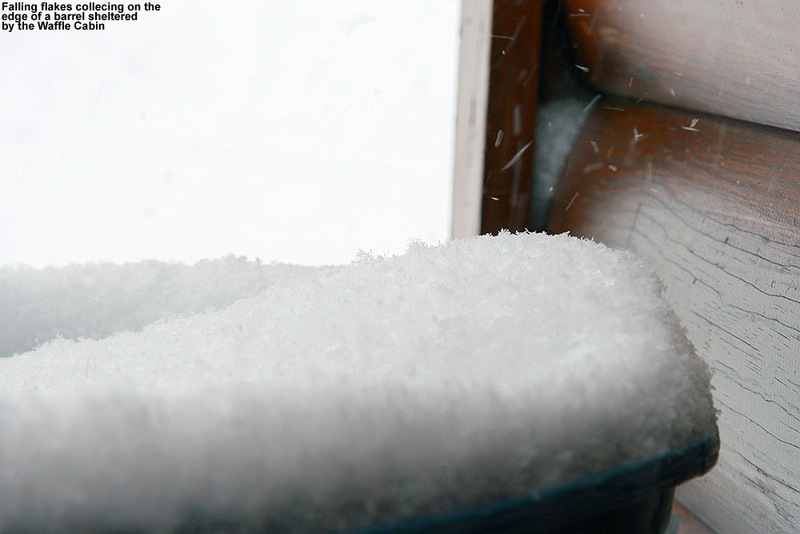 At times we were getting some bursts of heavier snowfall even down at the house, and directing the boy’s attention outside toward the big flakes helped inject a little more alacrity into their preparation. I dropped E and the boys off in the village circle, and they did a quick run on Snowflake while I parked the car. Our plan was to meet up with Stephen and Johannes, but they were up on Vista and about to head in for some lunch, so we planned to meet up with them later. E told me that Ty got to ride up Snowflake with a stranger, a woman with a British accent, and after initially being somewhat diffident, he eventually had a good time talking. So that was a little adventure for him. After parking down near the Sports Center in preparation for our later visit, I found E and the boys at the base area and we hopped on Snowflake to ski over to Wilderness. E had said that she found the powder a little dense in explorations on their first run, and that the tracks of previous skiers underneath the most recent rounds of snow made things a little uneven, but it turned out that she had just sampled a windswept area or something, because a quick foray off Sprig O’ Pine revealed some very light, deep, and beautifully undisturbed powder. The big terrain park was closed while they were working on it, but I was able to traverse into some of the trees below and catch the bottom of the “Bonus Woods” as Quinn calls them. Even though recent snow accumulations had been minimal, the numerous rounds of dry powder from before were staying really well preserved with the consistently cool temperatures. I took a quick depth reading with my pole and found that the snowpack was essentially in the same state it had been for a while, finding the “base” was really just a function of how far down you wanted to push into the density gradient of powder. Making our way over to Wilderness we did a couple of laps featuring Bolton Outlaw and surrounding areas, and there was plenty of powder off piste. 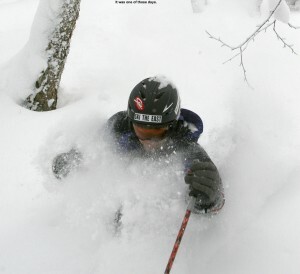 I did a check on the upper part of the Wilderness Lift and found 24 inches of depth as Kurt Ries passed over our heads on the lift and inquired about what my measurement pole was reading. I’d forgotten that the mountain was only running Wilderness Fridays through Sundays, so that made the untracked powder just that much easier to find. It was an exciting day for E, as she was feeling much more confident on her Telemark skis, and thus was really stepping up the terrain challenge with things like Bolton Outlaw and Wilderness Woods. She was working the versatility of the skis very well and throwing in alpine turns if needed, but from experience I know it’s especially fun to get to that stage where Tele turns are dialed in enough that off piste skiing becomes comfortably enjoyable. 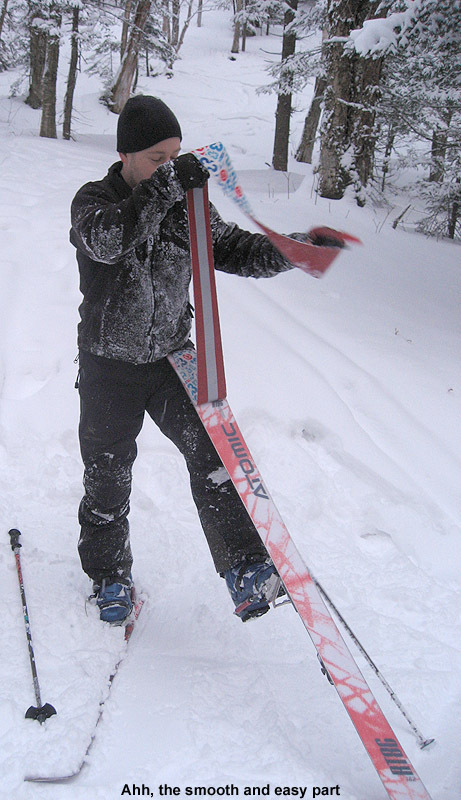 E was encouraged by the fact that we saw several other Telemark skiers in the Wilderness Woods at various stages of learning – the lower mellow pitches there are great for learning, especially since the glade crew cleaned things up in the off season. Lower down we skied various combinations of Lower Turnpike and the bobsled racetracks off in the trees, enjoying my favorite high-banked corner near the bottom. E said it was reminding her of playing Mario Kart. To check out the rest of the text and see all the pictures from the day, head to the full Bolton Valley trip report from today. 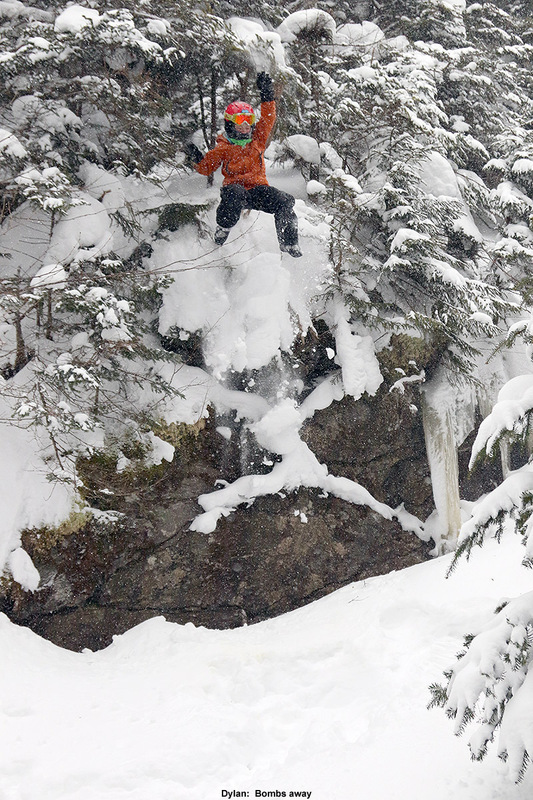 There was some fantastic powder out there in the Bolton Valley backcounty today. After a great powdery outing with Dave up on Bolton’s Nordic/backcountry network on MLK Monday, our next snow event began the following day. It was one of those low pressure systems in the Great Lakes that redevelops as a coastal, and as has been the trend this season, Northern New England was outside of the areas of heaviest precipitation. However, we did manage to get some snow out of the event. While there was no snow falling in Waterbury at the house when I left in the morning on Tuesday, a couple of hours later it had started up in Burlington. When I got home that evening I found 4.2 inches of new snow on the snowboard, and it turned out to be some reasonably dense, base-building material. In the valley we wound up with 6.5 inches of snow comprised of 0.63 inches of liquid with that event, and then a similar system came in for yesterday. We were even farther out of that one though, and would up with just 1.6 inches of total snow at the house. 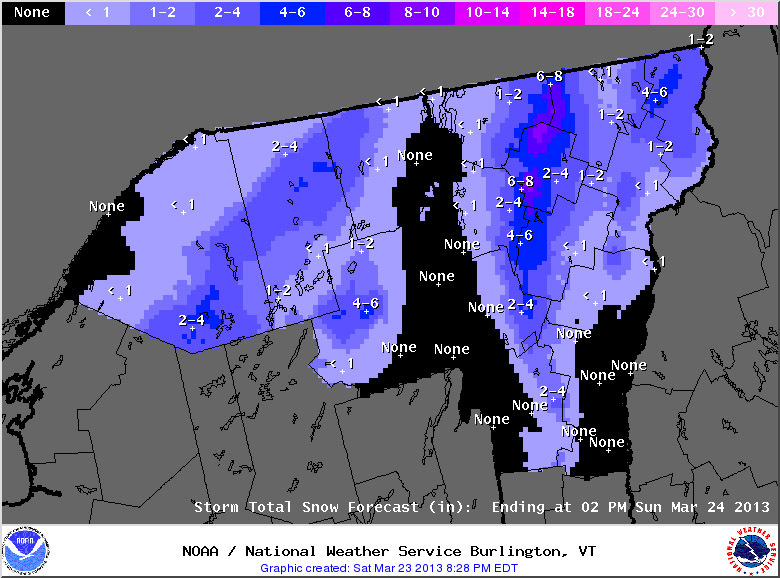 As expected, the mountains did somewhat better, and Bolton had picked up over a foot of snow for the week. The big weather event for this weekend isn’t snow however, it’s the cold. 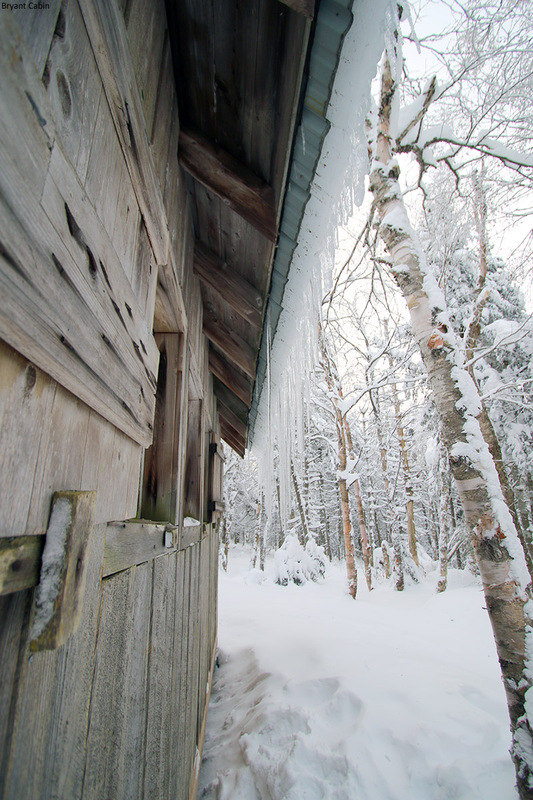 Highs are expected to be around 10 F today, and then perhaps not even get above zero tomorrow. E and the boys decided not to ski based on the cold forecast, but today’s temperatures seemed like they would be pretty nice for a backcountry tour. I waited until about midday for the temperatures to warm, and warm they had! Driving toward Bolton, the temperature was almost 20 F in the valley, and it seemed quite a bit warmer than initially thought. Even up in the village above 2,000’, the temperature was already 10 F and rising. Kicking off my tour, I headed up Bryant as usual, and was treated to blue skies and lots of white trees. I could feel that the temperature was cooling down as I gained elevation, but I still had my hat off at times to keep cool. 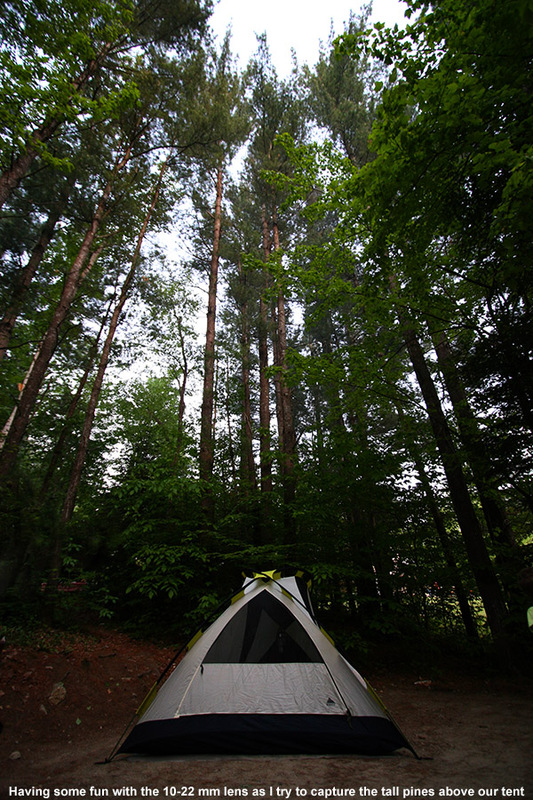 Once I reached the Bryant Cabin I assessed some tour options. Ty was having some friends over for a birthday party starting at 4:00 P.M., and I still had to do some grocery shopping on my trip home, but it looked like I had time for a longer tour that just a Bryant lap. 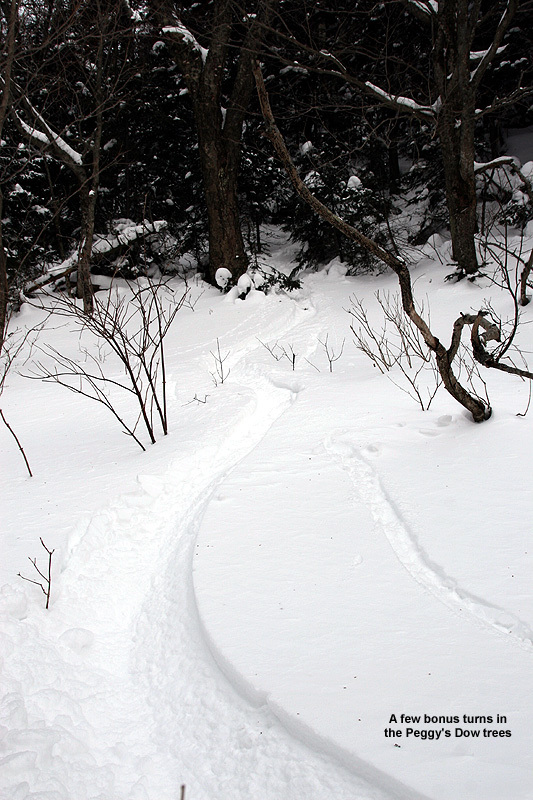 I decided to head out north for a bit along the Bolton-Trapp/Catamount Trail and catch some turns off there. 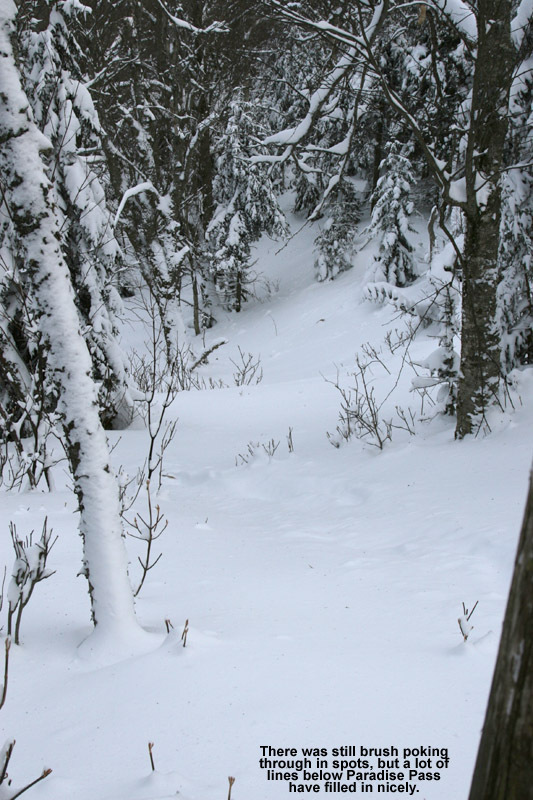 The trip through the flats to the North of the cabin was fairly quiet, with more white trees and lots of deep snow visible on the steep slopes to the east. I saw one other skier in the flats on what looked like lighter touring gear, and then I saw another pair of skiers at the top of the drop in for the Cotton Brook trail. I kept going and assessed some glade options on the high side of the trail. 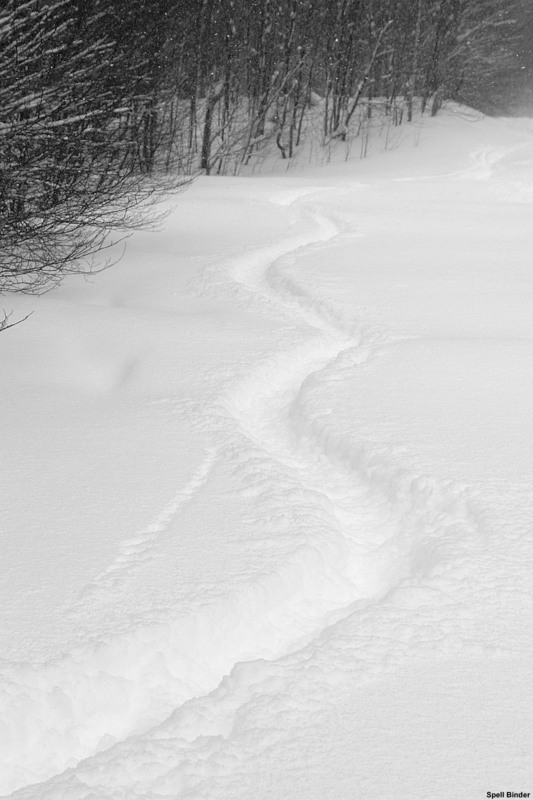 There were a few tracks, but plenty of lines that hadn’t been visited, and the powder looked fantastic both above and below. 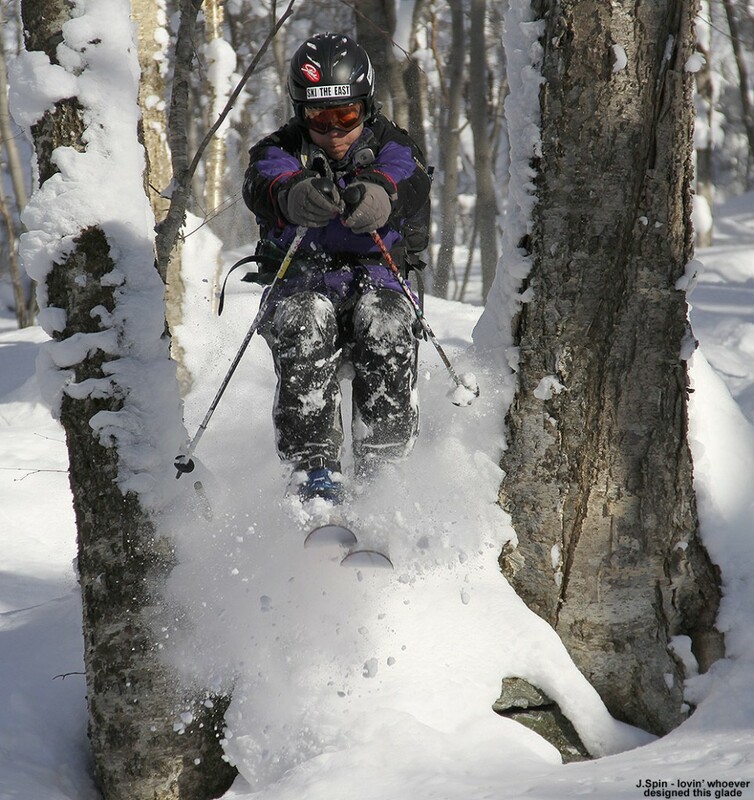 To read about the descent and see all the pictures from the day, head to the full report from the Bolton Valley Nordic & Backcountry Network today. Dave stayed over through today, and the plan was to get in another day of skiing. With the amazing powder conditions I’d encountered on Thursday, Saturday and Sunday, combined with additional snowfall, it was a no brainer to try and make some turns on the holiday. 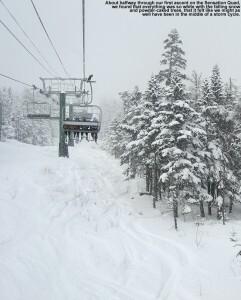 We had contemplated lift-served skiing at Bolton or Stowe, but with the forecast high of roughly 10 F in the valley, E and the boys decided to take the day off from skiing, and Dave and I ultimately decided that it was a day to avoid sitting on lifts. 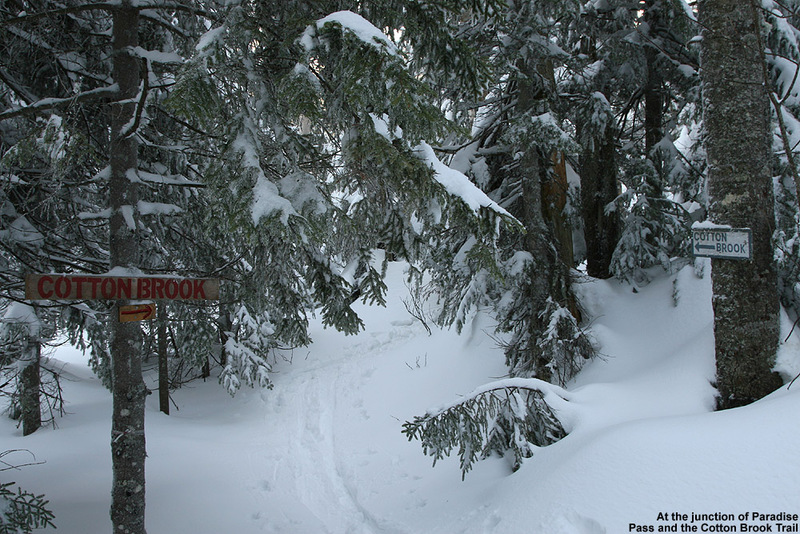 The plan was set for another round of skiing on Bolton Valley’s Nordic/backcountry network. 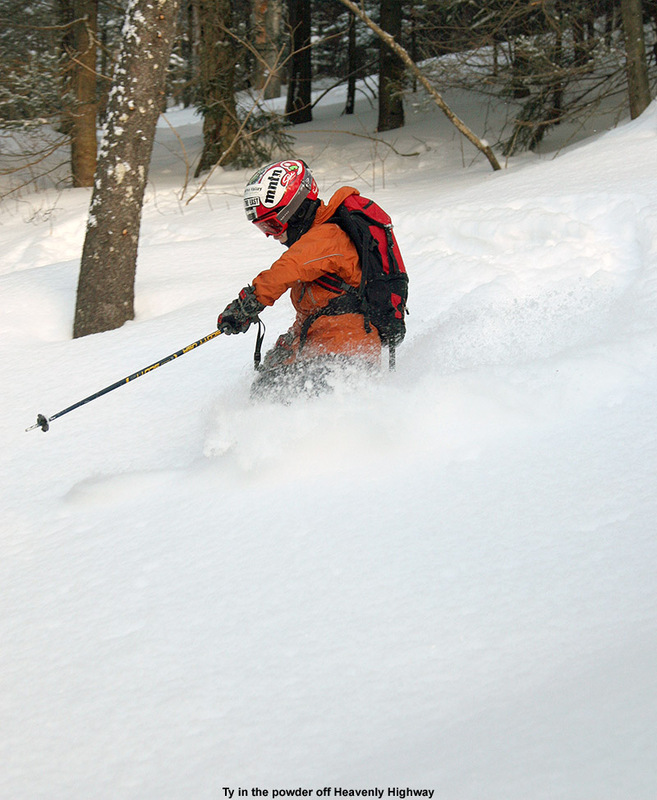 I’d brought Dave for his first tour in the Bryant region of the trail network back on January 1st, and since the warm weather had turned the powder to mush at that point, the touring was actually the focus, and the ski descent was more peripheral. 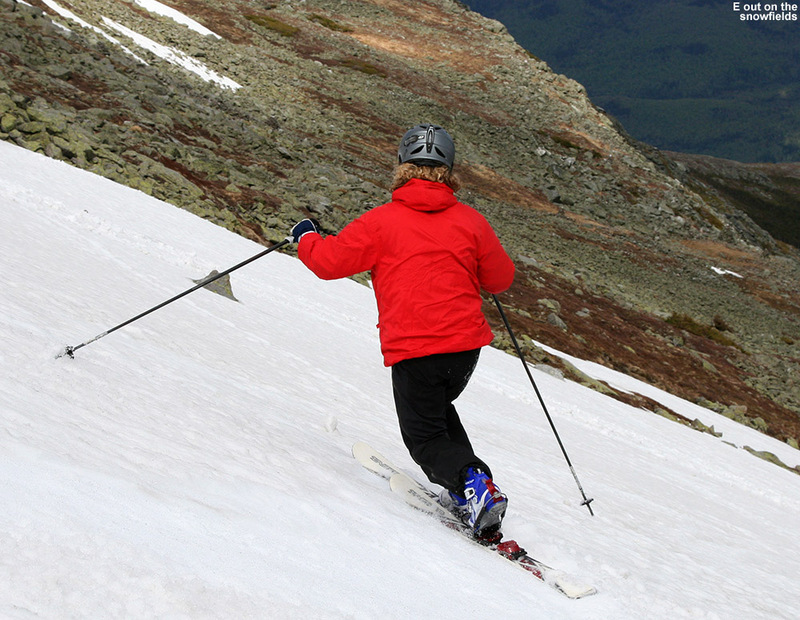 The skiing at that point, while still fun, was really more useful as an efficient way to get around. On that earlier outing though, I specifically told Dave to envision what the area would be like if it was filled with powder, because that’s that way it is most of the time. 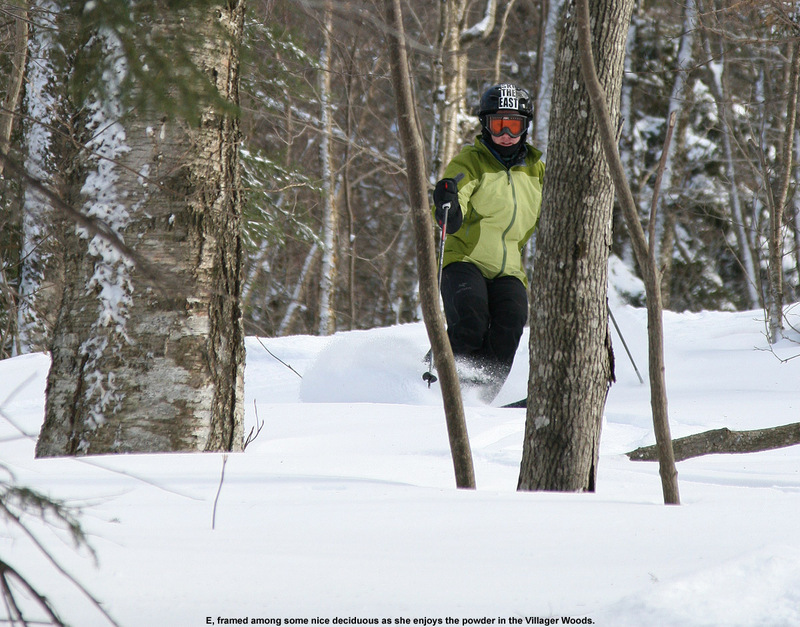 With the efficient setup of trails, skin tracks, and glades, along with the incredibly convenient access from the village, it’s quite an amazing resource. This time around, Dave was going to have the chance to see the area in top form. Up at the village, we stopped in at the Nordic/Sports Center so Dave could grab a Nordic ticket. Having a season’s pass, I only stop in the sports center occasionally, and hadn’t noticed what a nice place it is in terms of a day lodge. There’s a snack bar, and lots of space to change. I saw a mother and daughter changing in there, and they had the entire place to themselves. Dave and I had already planned to gear up at the car, but it made me think about using the area in the future, especially with the boys. E has been planning to bring the boys up there for swimming etc., but in a total coincidence in terms of my visit, Johannes was also up there today with his mom and sister doing just that. Johannes wrote about his experience at the Sports Center on VTSkiReport.com in an article entitled “When it’s too cold to ski…”, so for those that are interested in learning more about the options at the sports center, check that out. With the way Bolton’s season’s passes are including access to everything this season, it’s a great perk. For our part, Dave and I decided that it wasn’t too cold to ski, especially when powering our own ascents. We headed over to the usual tennis court parking along the edge of the trail network at about 2,050’, prepped our gear, and got skinning. Although my car thermometer was reading in the low single digits, there was no wind, and the sunshine was really doing its thing. We hadn’t been long on the trail before we were heating up and removing clothing. Dave even had to take his hat off. We had a fairly quick and steady ascent up to the Bryant Cabin (2,690’) checking out some of the glades along the way. We could see that there were descent tracks on some of the more popular runs, but plenty of fresh powder was waiting. Check out all the text and deep powder pictures by clicking through to the full report from Bolton Valley today. 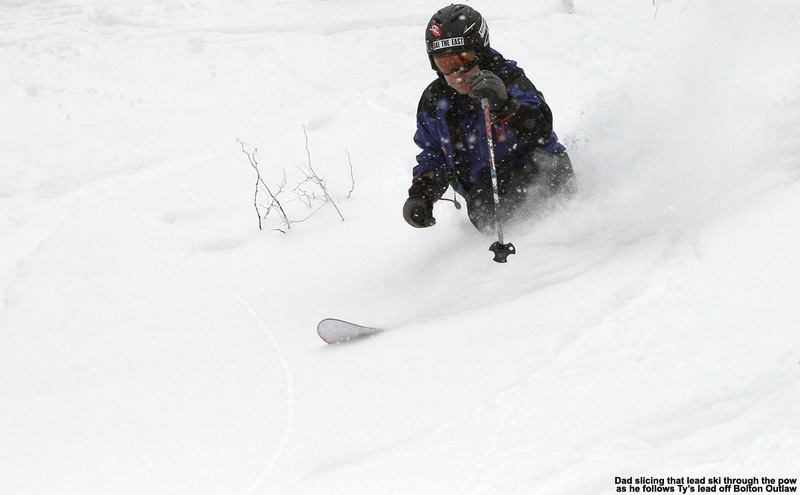 Jay grabbing some air among the deep powder in Bolton Valley’s Nordic & Backcountry Network today – Dave was having a blast firing away with his Canon EOS 7D. 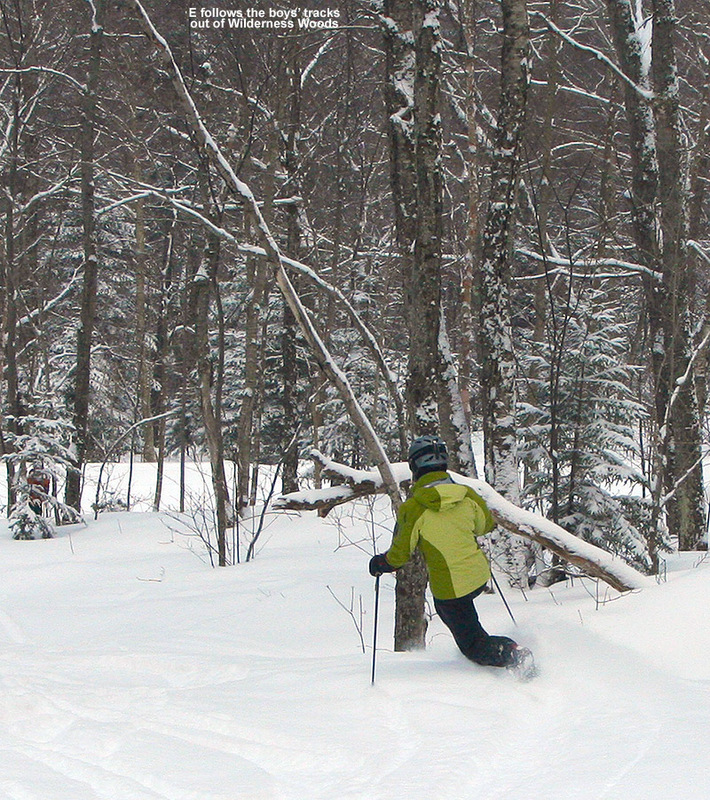 Jay skiing the deep powder in the Villager Trees at Bolton Valley today - let's just say that the skiing was GOOD! Dave had heeded my late week alert about the good skiing, so yesterday evening we worked out a Sunday morning Timberline meeting. The clipper system that had started up midday yesterday dropped roughly 4 inches of new snow at the house by 6:00 A.M. this morning, with most of that coming in at 3.7 to 3.8% H2O according to my analyses. What it meant for the local mountains was more fluff on top of fluff, so the powder skiing just continued to get deeper. Dylan had a midday birthday party (shouldn’t there be a Vermont state law mandating only evening birthday parties during ski season? ), and E was taking him to that, leaving just Ty and I to join up with Dave. On the upside it meant that Dave and I could really run Ty ragged as we marauded our way through Bolton’s powder stashes… and apparently run him ragged we did. Bolton had only reported 3 inches of new snow in the morning, but based on what we got at the house, combined with what we found on the hill, I think it was a bit underreported. 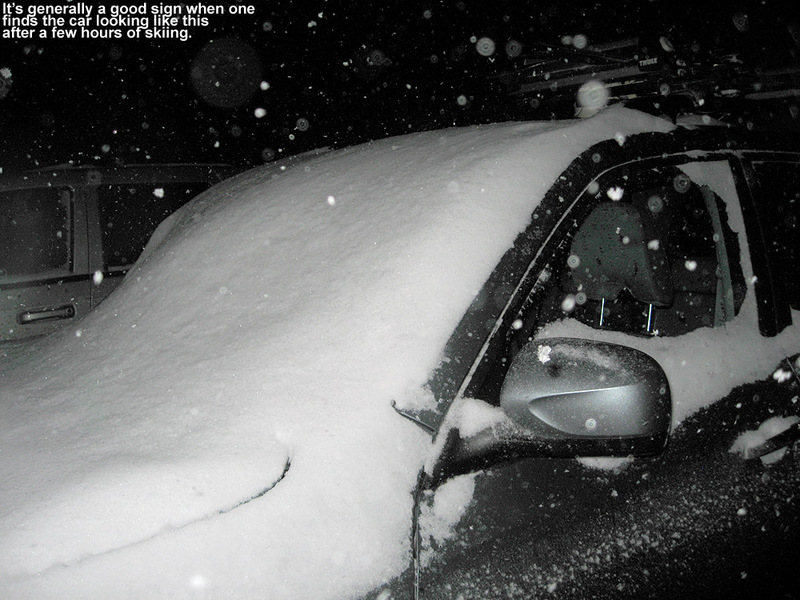 Conservative snow reports are generally appreciated though. While we waited for Dave to arrive at the mountain, we took a warm up run on Spell Binder, and I found 6 to 8 inches of snow on much of the trail. Ty really ripped it up on there and he was off to a great start. 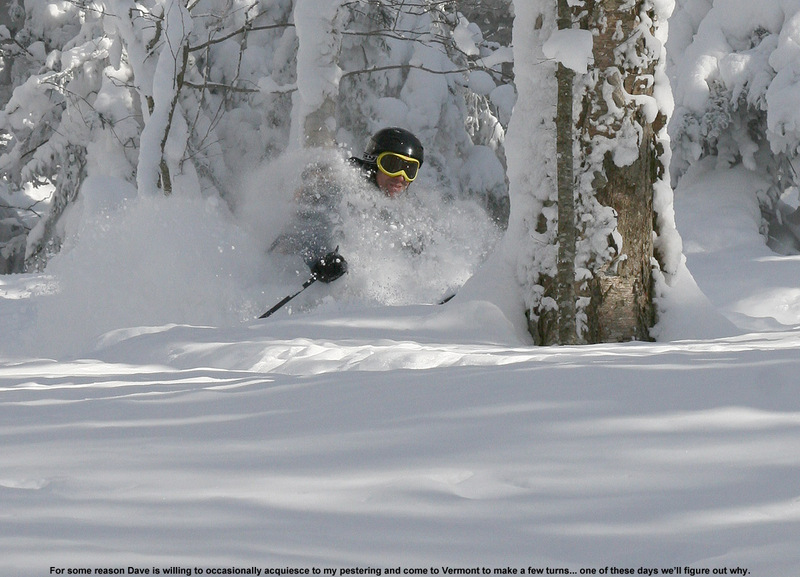 Continue on with all the powdery pictures and text at the full report from Bolton Valley today. 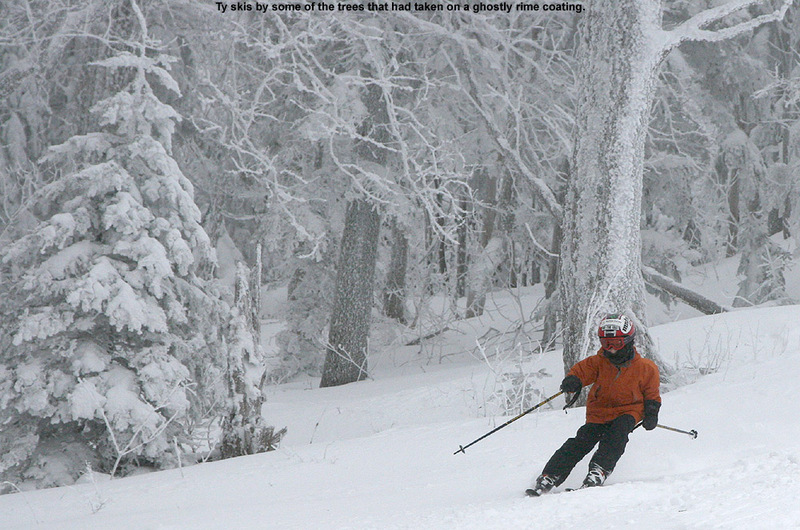 Ty hits up some of Bolton Valley's powder in the Wizard Way trees today. Last week’s midweek system had continued the excellent stretch of snow, yielding a great dose of dry Champlain Powder™ up at Bolton for Thursday, and then snowfall from that system continued at a slower pace right into the holiday weekend where a clipper was due to add more fluff. Today, the whole family headed up to the mountain to try and catch up with Stephen his kids for the reopening of Wilderness. Ty was a bit out of sorts at first, so Dylan and I took a mid mountain run on Timberline to get going. The snow quality was excellent on piste, not quite perfect in coverage since there were a couple of spots to watch out for as we skied the skier’s right of the Showtime headwall, but any coverage issues there were pretty minor. Once everyone was set, we headed over to the main mountain and hooked up with Stephen, Johannes, and Helena. With all the kids, the makeup of the group was constantly in flux, but on my end I had a couple of ripping runs through the Turnpike bobsled tracks with the Ty and Johannes. We hit those banked corners like race cars. On another run I was guiding Ty, Johannes, and Helena through some of the Wizard Way trees, and the end result literally saw Helena swimming the backstroke through the deep powder to get back to the trail. Unfortunately I didn’t get a shot of that, but I did grab one of Ty in there working the powder. Johannes and Stephen were also out getting pictures, and they put together a substantial slide show along with Johannes’ report from the day at VTSkiReport.com. Amanda was out on the Nordic network for a tour, and it sounds like she had quite an adventure, but I really liked her description “It felt like walking through clouds” with regard to going through the powder. It certainly was that kind of snow. I was happy to have my first Kurt Ries sighting of the season, and learned that he has the same Telemark skis as me! A definite thanks goes out to Icelantic at First Tracks for turning me onto those. I actually saw no less than four pairs of RT 86s at the mountain on Saturday, all mounted Tele, so they seem to be quite popular. 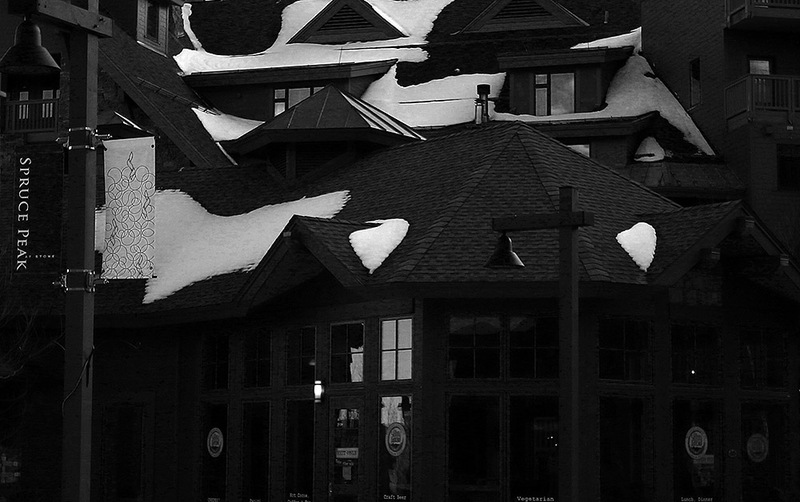 To check out the rest of the story, head to the full report from Bolton Valley today. This morning it was skiing in the trenches at times with one to two feet of Champlain Powder blanketing the slopes of Bolton Valley. I was too busy to get out on Monday for the bounty of upslope snow that followed the weekend’s inverted trough system, but overall it was quite a nice event. By the time it finished up on Tuesday we’d reeled in a total of 18 inches of snow at our location in the valley to make it our second largest storm of the season, and as usual the mountains were piling it up even more. Fortunately, right on the heels of that system was another Nor’easter, and it looked like I would have a little time to make a trip to the slopes. I got some work done at the house in the morning, and then headed up to the hill a bit after opening time. It was windy up in the village, and while booting up I could see that neither the Vista nor Mid Mountain lifts were running; I threw my skins in my fanny pack just in case it came down human-powered powder acquisition. 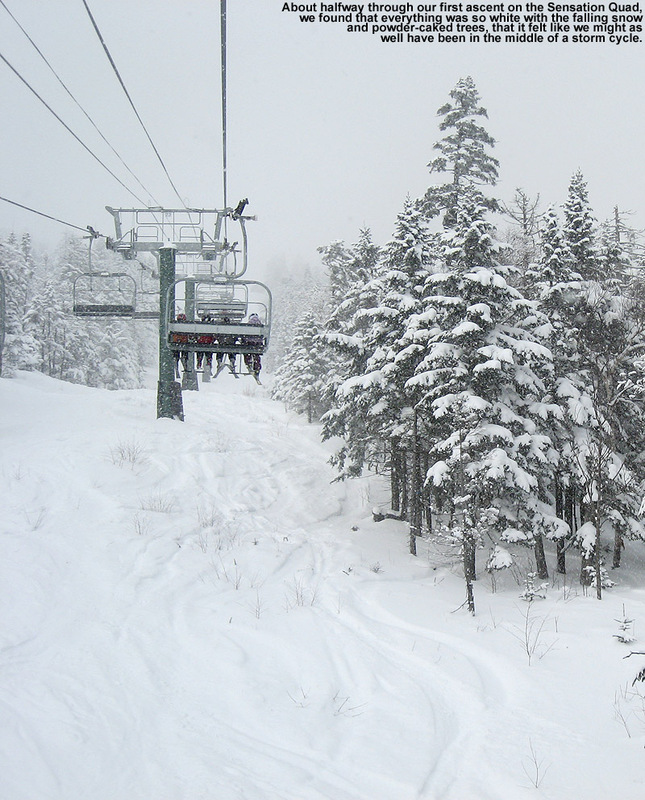 It turned out that the skins were able to stay in the pack, as I hopped on the Snowflake Lift and found out that Timberline area, in all its beautiful wind-protected Champlain Powder™ nirvana goodness, was ready to roll. The first skiers were already descending Spell Binder as I made my way to the Timberline base, and I couldn’t help but stop for a couple of minutes, absorb the scene, and grab a few photos. 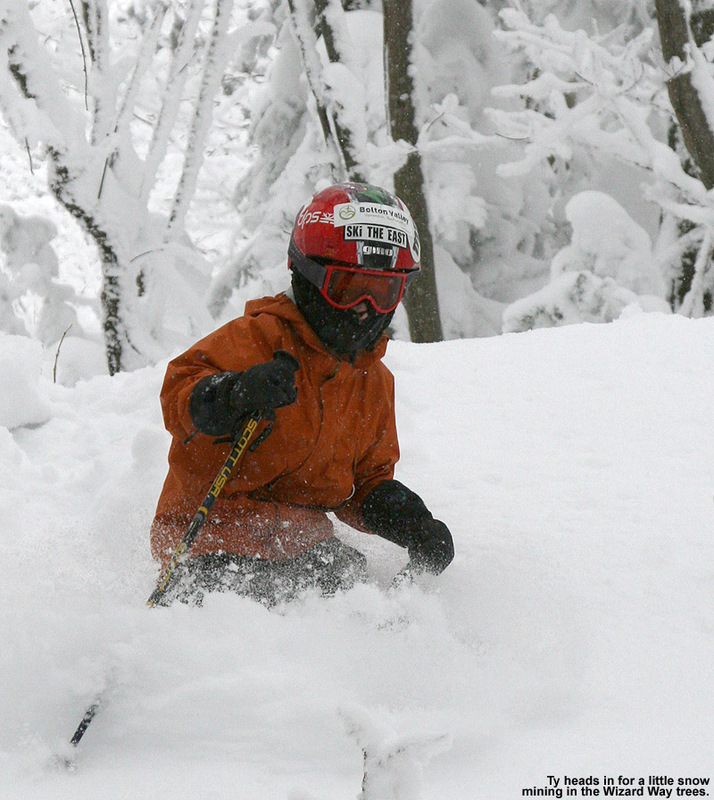 The quiet of the powder morning was disrupted only by the erupting “Woos” and “Yeeee Haaaas” of the skiers. Several people passed as they headed for another lap, and not one of them could seem to contain their vocal exuberance. It was already obvious that the snow was fantastic, but if discerning midweek Bolton skiers were this excited, the powder skiing was likely to be top notch. 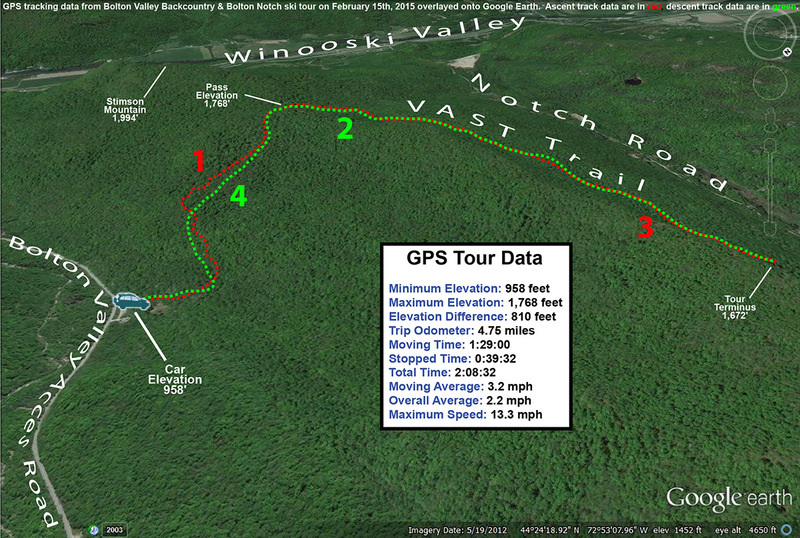 To check out the rest of the story, continue on to the Bolton Valley trip report from today. At the end of our day at Stowe today, I found our Subaru covered in a deep coating of fresh snow that had accumulated during the afternoon. Today was our first school program session of the season, so we were off at Stowe for the afternoon. With the level of skier traffic, especially weekend skier traffic that Stowe sees, Sunday afternoons don’t typically offer optimal snow surfaces. However, last season had to be a low point in that continuum; not only was the snowfall below average, but an inordinate number of times the next round of snow seemed to come in for Monday, after we were done skiing. So far this season however, things have been much better. We had fresh snow for our training day back on Sunday, December 12th, and as we moved into our first session with the students, it looked like Mother Nature was going to try to help out with fresh snow again. 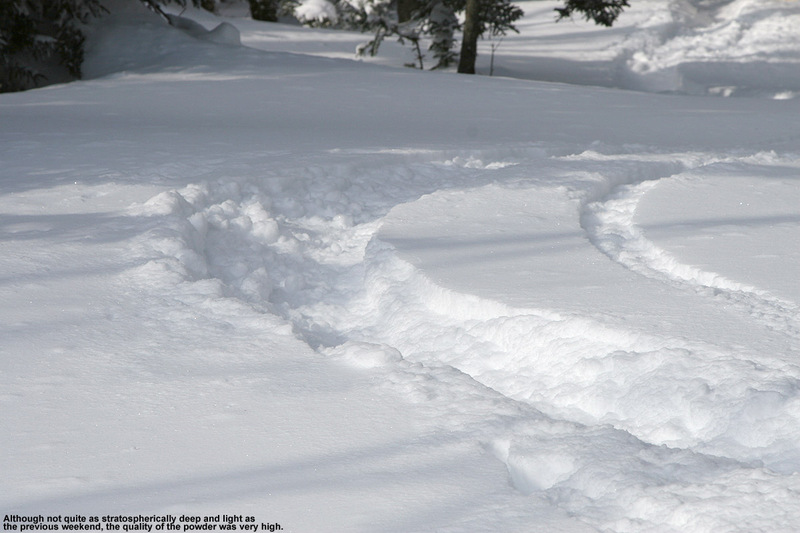 On Friday, an inverted trough system had set up shop over New England, and while the focus was south of our area, we’d managed to pick up a couple more inches last night. 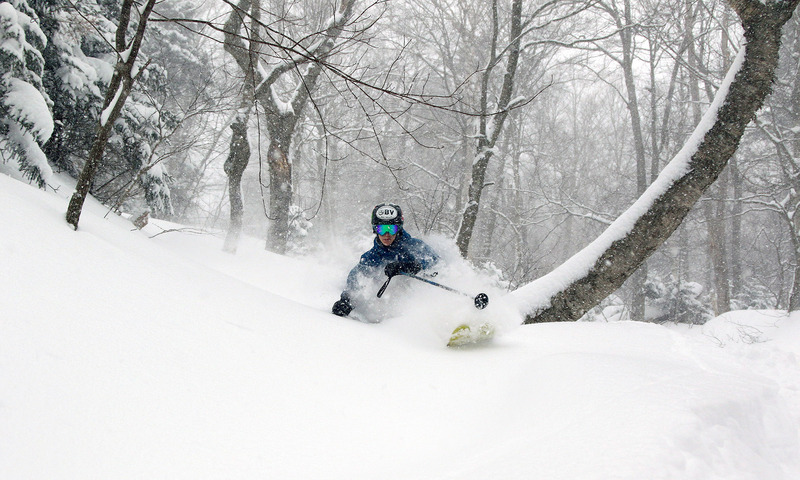 This morning’s snowfall report from the house at 6:00 A.M. revealed that we’d already picked up almost a half foot of snow, and it’s easy to imagine what the skiing was like at Stowe today when the snow just kept pounding down – for all the details and pictures, head to today’s trip report from Stowe Mountain Resort. Jay gets set for the descent. I checked out Bolton’s snow situation and alpine trail offerings in the middle of the day today, and after heading home, I filled E and the boys in on what I’d found. Since there was plenty of powder, but not a ton of lift-served trail options were available, we decided to head up to get in some backcountry skiing for the end of the day. Dave and I had found that the amount of base snow was excellent when we’d headed up to the Bryant Cabin the previous Saturday, so we were expecting great things with all the fresh stuff on top of it. Our 3:00 P.M. start resulted in twilight turns through the powder in the areas below Bryant Cabin, so it was quite an adventure for everyone. To see all the pictures and read the whole story, click through to the full backountry trip report from this evening. Northern Vermont wasn’t the focus of the weekend’s inverted trough system, but Bolton had reported a couple inches of new snow. We’d seen generally small flakes from the system at the house, but in the late morning when they started to get much larger, I figured it was time to head up to the mountain and see what was going on up there. Getting into my bindings near the base of the Timberline Lift, I saw a snowboarder coming down the final pitch to the base, but more importantly I could also hear the sound of his board – generally not a good sign. 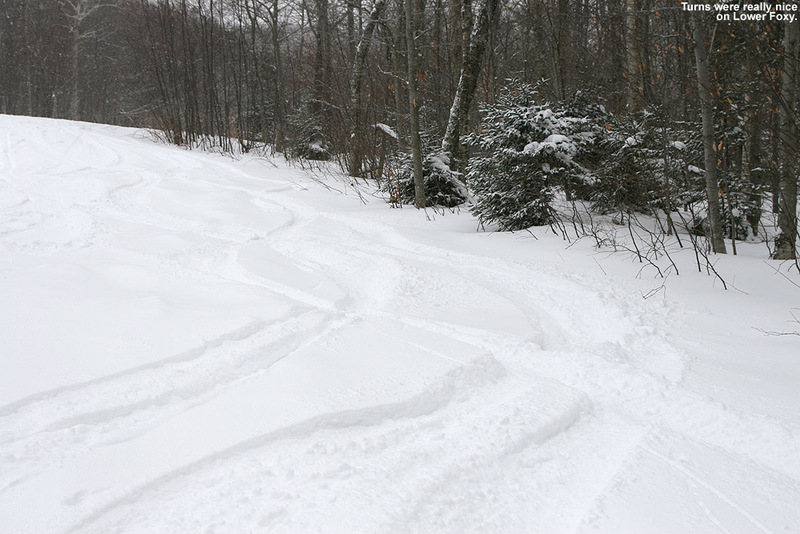 Coverage didn’t look too bad on even the natural snow trails, but it was still just the combined coating put down by the midweek clipper and the weekend system. There were several inches of new snow, but closer inspection showed that there were still some bare spots under there, so it wasn’t surprising that the mountain was keeping most natural snow trails closed. Off of the Timberline mid station the only real option was to head straight down Showtime, so that’s where I went for my first run. The base snow was manmade, and generally quite capable of holding an edge, but it was definitely not in the same class as the natural snow we’d been skiing over the holiday week. I checked off the edge of the trail to see what the natural snow situation was, and over the base I found generally 4 inches of powder in that 1,500’ to 2,250’ elevation range, with a few spots of 5 inches. That represented the sum of the fluff from the clipper and the latest denser synoptic snow from the inverted trough on top of it. All in all it was actually a fun run, and there were plenty of nice powder turns to be had along the edge of the trail. Click through to read the full report from today.